Under the glow of star-filled summer night skies and moonlight, Mt. Oakan seems to float above Lake Akan. Lake Akan is the only place in the world where marimo grow into spheres. Representing the marvelous marimo, glimmering green capsules create a magical spectacle of light upon the laketop. Winner of an Award of Excellence in the 21st Hometown Event Competition, the Akanko Marimo Natsukito (Lake Akan Marimo Summer Lantern Festival) will be held once again this year. An illuminated cruise ship will set sail for the deepest point of Lake Akan, carrying written wishes of participants. When the ship reaches kamuy ramu (heart of the deities), the centerpoint of Lake Akan’s mystical energy, the gathered participants each offer a prayer for good luck. Then, as the ship proceeds across the illuminated laketop, participants throw their glittering green, hope-filled globes into the lake. The scattering of the Natsukito will become even more spectacular this year. We have realized that more than just individual participants would like to deliver their wishes to the spirits of Lake Akan. From sweethearts to happily married couples, these wishes written by two hands will be sealed into koikito (love lanterns), in the shape of large marimo. These koikito lanterns will carry the thoughts of loving couples across Lake Akan. 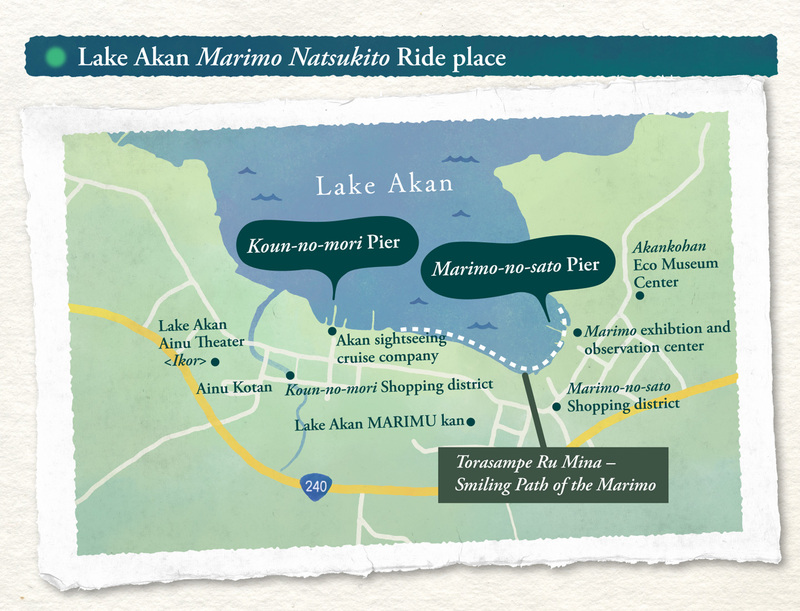 This year, festivalgoers will be able to enjoy Natsukito from the lakeshore promenade which connects Lake Akan’s two piers. Ainu-patterned lanterns will softly light the path known as Torasampe Ru Mina, which is Ainu for ‘Path of the Smiling Marimo’. From here, gazing across the lake will provide a beautiful view across the laketop, illuminated by the glowing green orbs as if by magic. The festival will be held from Saturday, July 1st to Thursday, August 31st. The ship departs from Marimo no Sato Pier at 19:50, and from Kou’un no Mori Pier at 19:55. ✱ The ship departs from Marimo no Sato Pier, followed by Kou’un no Mori Pier. It returns first to Kou’un no Mori Pier, then to Marimo no Sato Pier. ✱ The event may be called off due to poor weather. ①When you board the boat, you will receive your capsule, green LED light, and a special paper upon which to write your wish. ②The ship will head towards Kamuy Ramu (Heart of the Deities), the central point of Lake Akan’s mystical energy. There, each participant will seal their written wish inside their marimo-shaped capsule. ③Next, the ship will head towards Pirka Ramu (Heart of Beauty). There, please cast your capsule into the lake. ④While participants send their hearts out over the green-glowing laketop, the ship will turn for home. ⑤The written wishes will be offered at Akandake Shrine. All are very welcome -- couples, husbands and wives, families, and more. ✱ Only passengers of the Natsukito Cruise Ship may participate.